The Georgia District - Optimist International is nearing their 75th Anniversary and they are celebrating with pride - pride in their accomplishments and service; pride in their fellowship and friendships; but most all, pride in being a Georgia Optimist. They've created a video to share that special feeling with you. 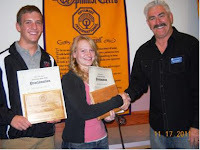 As I've commented on this blog before, individuals belong to Optimist Clubs. Optimist Clubs belong to Optimist International. The district serves as an administrative arm to help Optimist International share information and leadership and help the organization grow. I'm always fascinated when individuals identify primarily with something other than an Optimist Club for the club level is where we make a difference. The Georgia awareness campaign is focusing on individuals over clubs. Answering the question, "What's in it for me?" they highlight three individuals, among others, who say that being a Georgia Optimist gave them the opportunity to develop personal skills like public speaking, confidence and self esteem. I give the Georgia Optimists high marks for their passion, fellowship and promotion and hope that in the future they remember their club-level roots, for without an Optimist Club, none of their achievements are possible. The Breakfast Optimist Club of Sacramento, California is planning for the new year with their first fundraiser and community service project all wrapped up into one. 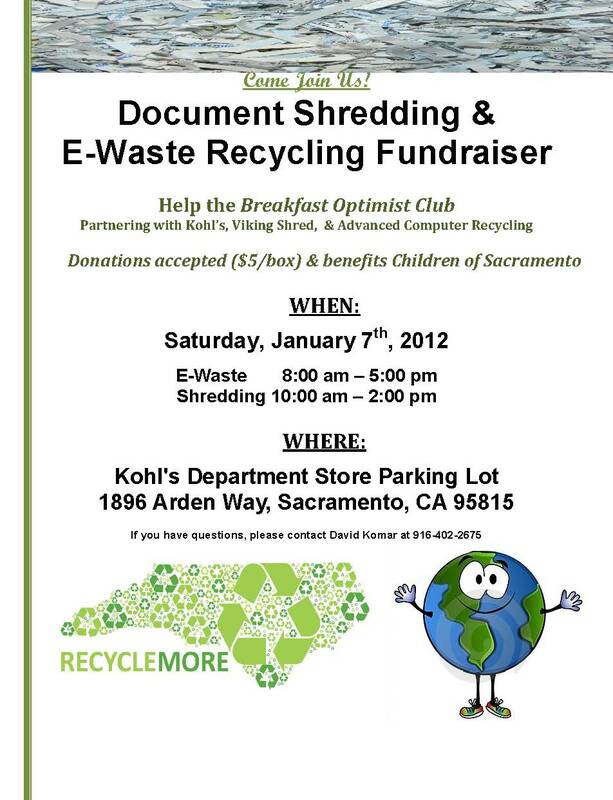 The Sacramento Breakfast Optimist Club and Kohls will hold an E-Waste and Shredding Event on Saturday, January 7th, 2012 between 8 and 5 pm. at the Kohls Store Parking Lot: 1896 Arden Way, Sacramento, CA 95815. Shredding is scheduled for 10 to 2 pm. and a donation of $5/banker box is welcomed. This event is held as a fundraiser to help finance youth projects in our community. E-waste is the fastest-growing waste in the country and frequently contains hazardous materials like lead and mercury, which can adversely affect the environment. Everything from laptops and desktops, televisions and cell phones are collected at the event. Following the event, equipment is property disassembled and recycled into raw materials to be reused to manufacture new items. All equipment is destroyed and recycled in an environmentally sound manner by a fully permitted recycling facility. "Why not kick-start the year by giving your old electrical items a new lease of life and recycling them at our community event?" asked David Komar, Event Coordinator. "Last year, residents participated in this free opportunity to safely and securely dispose of their electronics, and we are please to continue to offer this service to the community and help, protect the balance of our environment," he concluded. 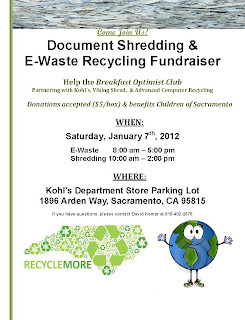 For more information, please click on the flyer or visit the Optimist Club event partners Viking Shred or Advanced Computer Recycling. It's Christmas Day, and although I am not religious I have noticed a public outcry this year to "remember the reason for the season" and "put the 'Christ' back in Christmas. To me, such sentiments so often seem intolerant of others who share different faiths and beliefs. For me, I believe the reason if the season is to remember others, those we know and those we don't, with kindness and goodwill. Only then is it appropriate to celebrate our own personal treasures of health, family and friends. For Music Sunday at Experience Optimism today I offer a diversion from the typical Christmas fare. In this scene from the movie "The Holiday," two women find love and friendship. I wish both for you during the holiday season and throughout the year. Please enjoy Aretha Franklin in "You Send Me." The Boise Noon Optimist Club recently welcomed guests from the Mountain States Tumor Institute (MSTI) at St. Luke's Regional Hospital, Boise, Idaho. Attending were Jessica Harding and Kelsey Breeding to discuss the child-life activities of which the Boise Noon Optimists are involved. As part of their commitment to Optimist International's Cure Childhood Cancer Campaign, the Boise Noon Optimists helped start the Beads of Optimism program at the hospital. The beads are given to the children as a way to mark milestones in their treatment that helps cheer them at difficult times; and later, the kids and their parents use the beads as a way to tell their story. According the Kelsey, about thirty children are in active treatment for cancer at MSTI. Most are in and out of hospital care so the hospital reserves fifty beds just for them. While many Optimist Clubs care for kids with cancer and their families on a local level, earlier this month Optimist International President Jack Creswell pledged an additional $500,000 to be raised for John Hopkins University Research Hospital in order to continue research into the eradication of childhood cancer. The beauty of social media is that you can be your own publisher, public relations director and marketing manager all in one. The challenge, of course, is to produce an abundance of content that people want to read or learn more about. It's a daunting task and I accept that some days I do it better than I do on other days. However, infographics like the one I'm sharing here today tell me that creating and publishing your own content is more important than ever before. According to Frugal Dad , six media giants control 90% of all content that is available for consumption. Whether you read, listen or watch, chances are your media is being filtered by "The Big Six:" General Electric, News Corporation, Disney, Viacom, Time Warner or CBS. All told, 232 media executives determine the media made available to 277 million Americans. This post isn't to ask how did we as an American public let this happen. This post isn't to teach you how to get the big guys to notice you. This post is to encourage you not be discouraged when your local media representatives seem uninterested in what you, a small service club made of of community volunteers, are doing. Chances are, your small concern does not have the wherewithal to feed the money-driven industry that dominates them. This post is to encourage you to keep writing. Post articles on your blog and website and post stories on Facebook. Post your videos on YouTube. Tweet about them. Talk about them. And please, send me a message about your project and a link to your post and I will highlight them here. 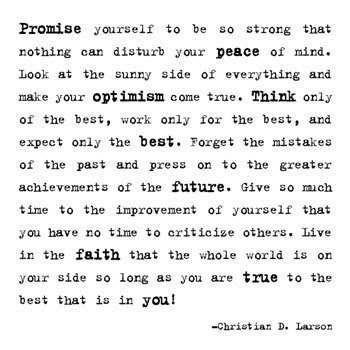 Let's create our own network of optimism. Together, we can do it! The Optimist Club of Cerritos, California collected more than 7,000 pounds of food this season to distribute to, among others, families they have adopted for the season through the "Needy Families" program that they coordinate with the Soroptimist Club. 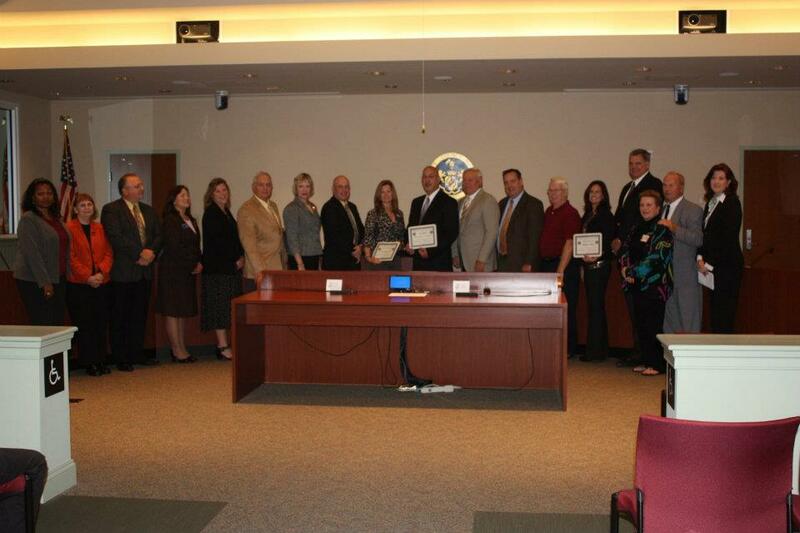 Annually, 25 families are identified through the Parks and Recs Department. This year they added 2 additional families. With the needs so profound this year, many Optimist Clubs are doing even more, or as Optimist International President Jack Creswell would say, "Optimists are giving 100% and then some." Giving time, talent and treasure through your Optimist Club, other service club, church or community organization is an important aspect of our own personal development. We can do so much more to make a difference when we work together. 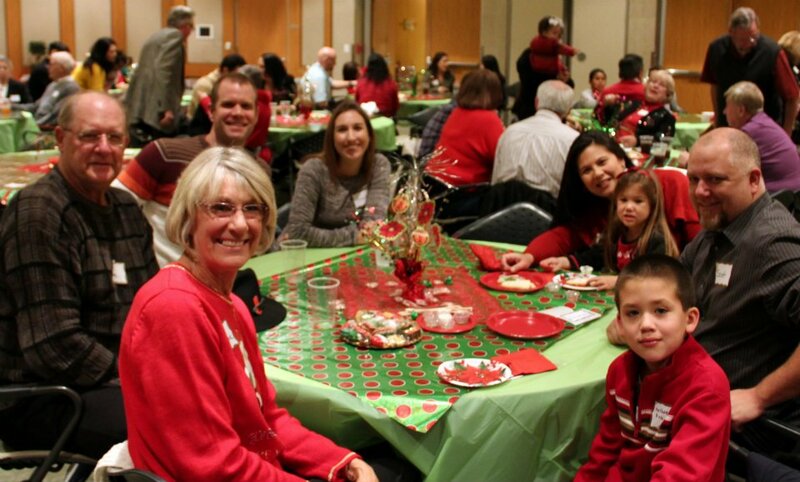 It's just as important that we celebrate together and as the holiday season offers ample opportunities to serve others, it also offers similar opportunities to nourish our families and friendships. 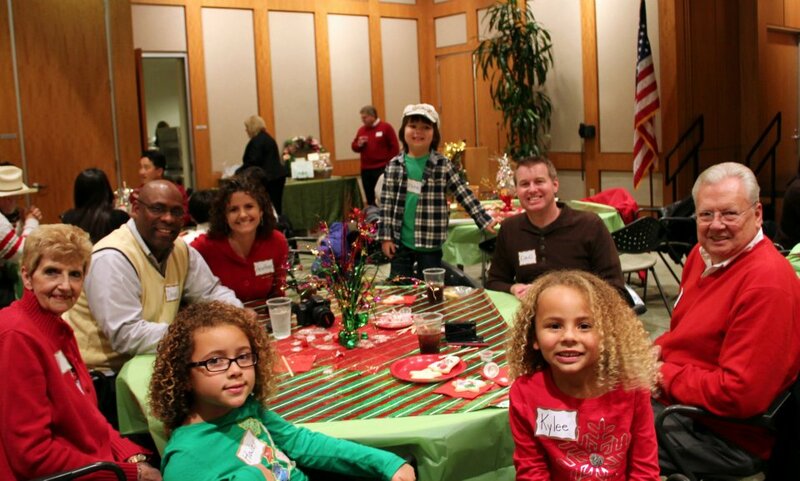 That is exactly what the Cerritos Optimist Club did with their Annual Christmas Party. I think you'll agree, the pictures provided by David J. DeKriek show that the celebration is just as meaningful for the adults as the children. Please use this post as reminder to do the same. Work hard, share your strengths, and take time to celebrate each other, the greatest gifts of all. 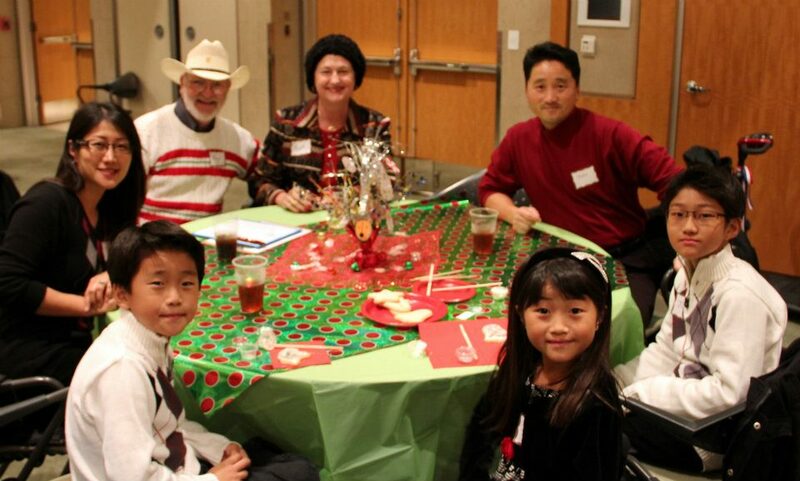 Photos courtesy of the Cerritos Optimist Club. Yes, it's an advertisement for Brooks Brothers, but I don't care. It is the cutest holiday video that I have seen this year and that makes it my pick for Music Sunday at Experience Optimism and my wish to you for the holiday season. In a world of orchestrated flash mobs that record songs that are too long to be enjoyed (not to mention the last one emailed to me crashed my computer), I found the 47 seconds of these adorable lambs to be just right. So go on and do it now. Dash right on through the snow and enjoy the holidays. Many cheers to you and yours as we count down to the big day now only one week away. Thank you Brooks Brothers for sharing the sheep. According to New York Times technology columnist David Pogue, communications today are two-way and conducted in real time and if your business is doing anything different, you risk losing the attention of those in the millennial generation. Although this video was aimed at those who wish to connect with the millennial generation, as a communicator, you can't stop there. Sure, individuals may have different communication styles based on their ages, but everyone wants to be included, have their voice heard, and know that what they contribute to the discussion matters. It's called sharing and my friends, whether you are two or ninety-two, sharing never goes out of style. If your service club is perhaps noticing that fewer members seem to be involved lately, please take a look at the video and apply its message across all generations. Even out that playing field and more people will show up to the game. Thanks to Ragan.com for the tip: "How to grab millennials attention." Six hundred and thirty-four children will open presents on Christmas morning thanks to the efforts of the Conway, Arkansas Optimist Club and area businesses who participated in the annual Angel Tree project. According to the chairman of the project, this year the Angel Trees, decorated with names and needed gift ideas, were adopted by local businesses and employees completed the Christmas wish lists. 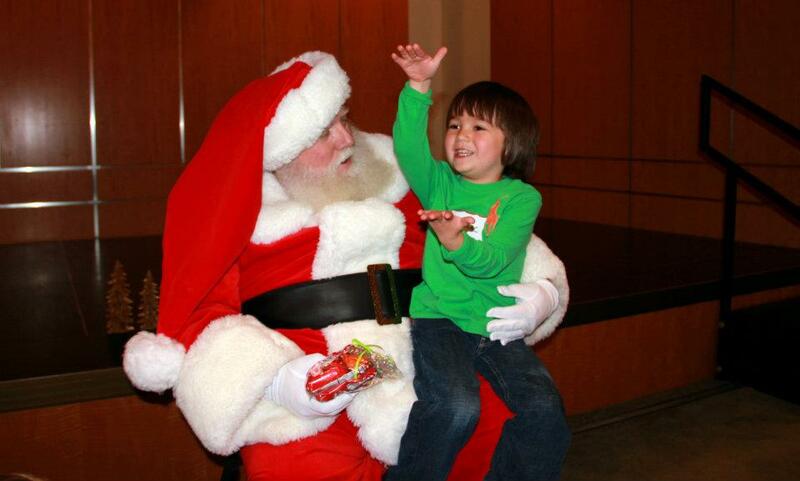 Some businesses fulfill wishes throughout the year. The video was taken at Hendrix Health and Wellness Center where Optimist Club and community members gathered to wrap and sort presents for distribution. Read all about it at theCabin.net. Why do you want to belong to an Optimist Club, or any service club, for that matter? This short video posted today by PhilanthropyVideo on YouTube features Neil Strauss, author of "The Game: Penetrating the Secret Society of Pickup Artists." In it, Strauss explains that asking donors to ask others to make a contribution helps reinforce their commitment to the cause. The key: ask for three reasons that they donate that are not financially motivated. Using this same logic, you can increase the number of members in your group, or come together with others to start a new Optimist Club. The reasons we belong are the reasons that will resonate with others and help them make the commitment to join. Talk about those reasons, a lot, and you'll be happier with your decision to belong and give your time as well as encouraging to others who want to come together with others to make a difference. 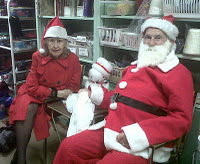 Santa says, "Join an Optimist Club"
The Optimist Club of Coquitlam, British Columbia has been assisting the Coast Sound Music Academy by selling Christmas Trees at IKEA. For only $20, customers can choose their tree, receive an additional $20 coupon for IKEA, and have the great spirit of Christmas provided by the Optimist Club. Their original $20 goes straight to the Academy's music program. What a deal! In more holiday activities, the Coquitlam Optimist Club also collected nearly 600 pounds of food for the Share Food Bank during the Annual Breakfast with Santa program. According to club spokesperson Annette Smith, more than 300 Sparks, Brownies, Beavers and Cubs, plus their siblings, parents, and leaders helped with the donations and were rewarded with "full tummies, candy canes, balloon art, and a sense of helping the less fortunate." Yes, Christmas is for sharing, but did you know that you can join an Optimist Club and have that feeling all year-round? 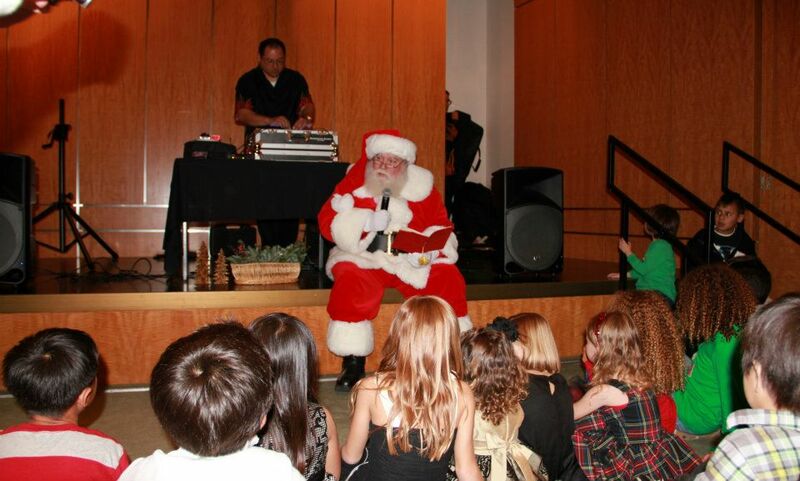 Santa says, "Find a club near you and join today." Labels: british columbia, food drive, holiday, optimist club. Party Rock is in the house! I love the Kia hamsters. Or more important, I love the Kia hamster dance. It's called the Melbourne Shuffle (Remember the Running Man?) and it really is pretty easy to do if you have a little space, a lot of stamina and don't mind looking rather dorky as you learn to stomp shuffle it out. But I think you'll agree that what makes the Kia hamsters rock is this totally awesome song, "Party Rock Anthem" by LMFAO. It's one of those songs that just begs to be played at halftime at a football game or reminds you of college, clubbing, and staying out way too late dancing or whatever you did after hours. The videos are perfect for Music Sunday at Experience Optimism. Be sure to leave a comment and let me know which video you dance to. In case you haven't had enough Party Rock yet, here's a lyrics-only version. Keep dancing. It's good for your heart. Another day brings us to another Optimist Club charitaable Christmas Tree lot. This time we visit the Optimist Club of Deerfield, Illinois where they have been using the proceeds from tree sales to offset expenses for projects in their community for 50 years. In fact, the Deerfield Optimists make it a point to reach out to the community with a project at least once per month with projects like Mudfest, the Halloween Hoopla and Optimist International Oratorical and Essay Contests and the Illinois District Just Say No to Drugs Poster Contest. 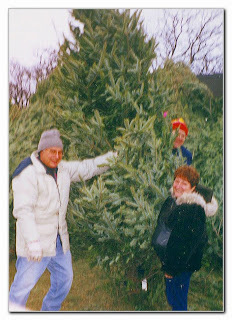 Please help them make even more happen in the community in 2012 by buying your tree at the Deerfield Optimist charitable Christmas Tree Sale at 836 Jewett Park Drive or get even more involved by joining them. Contact President Mary Lou Heinrichs today. This year marks the 57th year that the Optimist Club of Austin, Texas has offered charitable Christmas Trees for sale. 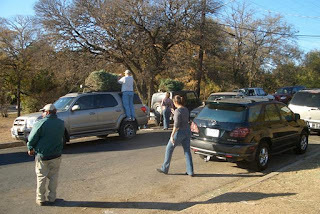 This year they are located at the corner of San Gabriel and North Lamar and they offer five different types of trees, Noble Fir, Fraser Fir, Grand Fir, Scotch Pine and Natural Douglas Firs. I think that kind of history and selection makes them an expert in their community. And of course the Austin Optimist Club is also the expert on bringing out the best in children for proceeds from the tree sales fund projects throughout the year like the Junior Golf Program, Optimist International programs, and local community organizations including, among other things, the Texan/Texanne Scholarships. The Austin Optimist Club is also involved in childhood literacy programs and they encourage their patrons to bring a new or gently used book to the tree lot to donate to bookspring, a community effort to help children develop the love of reading. Optimist Club members do so many wonderful things throughout the year. Please take this opportunity to support them by purchasing a charitable Christmas Tree. This season, like many before, the St. Andrews Optimist Club of South Carolina is in the Christmas Tree business. According to the video, they conduct this annual fundraiser so that they can provide projects throughout the year for children in the community. 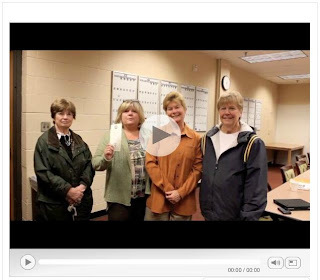 Projects highlighted in the video are: Families Helping Families, Ray Tanner Home Run, Optimist Oratorical Contest, Be All You Can Be, and the Children's Garden. Find out more by watching the video, visiting the St. Andrews Optimist Club website and by stopping by to purchase a charitable Christmas Tree. Located just past Harbison on St. Andrews Road, the St. Andrews Optimist Club charitable Christmas Tree Sale is going on now. Hurry in for holiday cheer with an Optimist promise that the cheer will last all through the year. Henry Graham, Sr. says that the secret to selling charitable Christmas Trees is snow and since the Optimist Club of Clayton, Missouri has bee hosting this fundraising activity for 64 years, I'm inclined to believe that he knows what he's talking about. 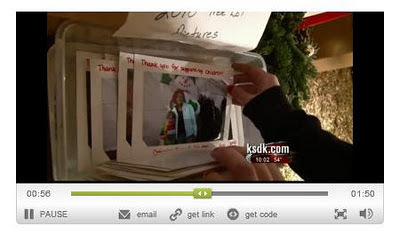 However, tucked inside this story from KSDK.com is what I believe is the true secret: goodwill. 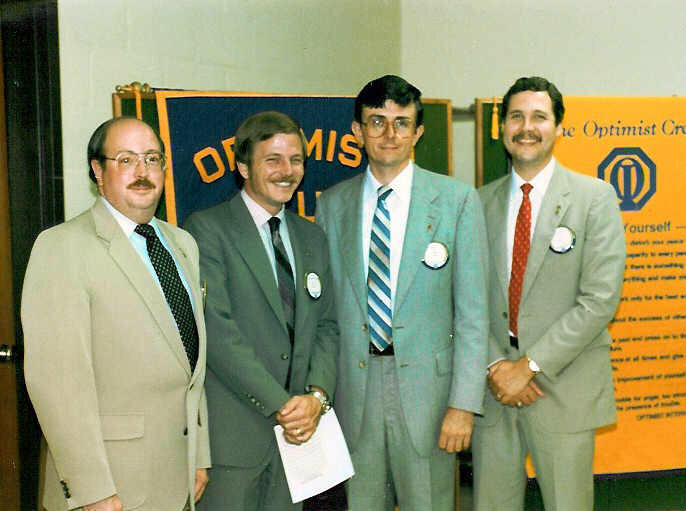 The Clayton Optimist Club connects with their patrons by snapping a photo of them one year and then giving it to them the following year as a "remember when" gift. What a cool idea. The Clayton Optimist Club charitable Christmas Tree lot is at the corner of Forsyth and Carondelet Plaza, Clayton, MO. Stop by soon to have your picture taken and know that your purchase will help children year-round. That's pretty cool too. Click to play video. Clayton Opimist Club on KSDK.com. Nothing represents December better than scenes from New York City. It might be because so many holiday movie classics use the city as their backdrop. 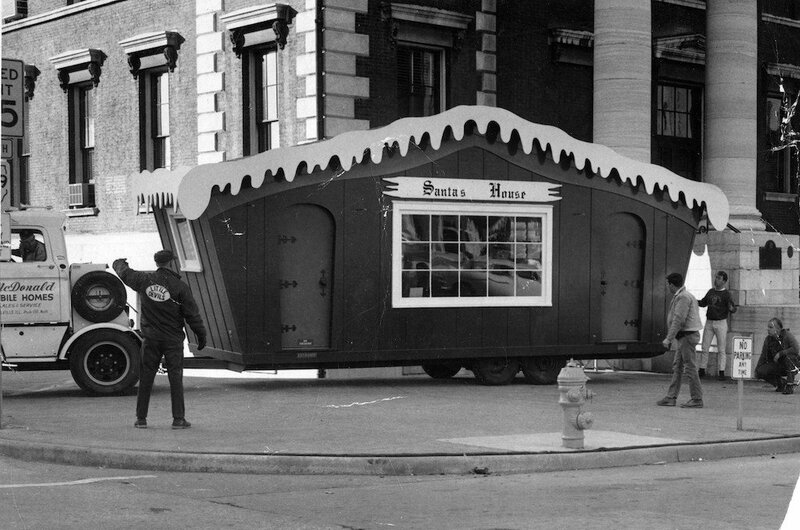 It might be because the major studio networks broadcast from New York City, often featuring guests on the street along with the decorations of the season. It might be that the holiday season starts in New York with the Macy's Thanksgiving Day Parade. Or it might be the simple romantic notion that finding love in a big city is as simple as looking out the window at the beauty that surrounds you. Whatever your reason, I hope you enjoy the Music Sunday video for Experience Optimism, "December in New York" performed by Cavan Te whose vocal stylings will remind you of Harry Connick, Jr. or Michael Buble. Find out more about the video at PRWeb. As much as I try to stay away from obvious choices on holidays, I couldn't resist this classic remembrance from the 1980s for a Halloween Music Sunday at Experience Optimism. "Ghostbusters " by Ray Parker, Jr. includes our favorite cast members from the movie and Saturday Night Live. Well, I guess they are your favorites if you were around in the 80s. It's a nod at happy, fun-filled music, movies and activities. If kids still trick-or-treat in your neighborhood, this song is bound to put in the right spirit. If your community opts for the trunk-or-treat option or perhaps your Optimist Club is holding a party, be sure to add this song to your playlist. Turn it up loud and enjoy. 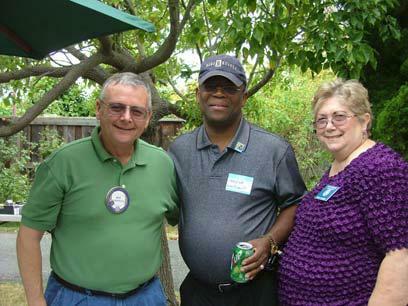 Optimist Clubs often wish they could find a spokesperson to champion their club to others. Well, the Optimist Club of Birmingham, Alabama has found a good one and a good cause to share: childhood literacy. Together with Miss Trussville, Chandler Champion, the Birmingham Optimist Club is supporting Books-A-Million and asking others to give their support at a book fair. According to Miss Trussville, portions of the sale will go directly to the Optimist Club to help with all of the programs they perform to help others and empower youth. What a great message. Thank you Chandler. And what a great idea for your community service group. Partner up with the young ladies chosen to represent your community as Miss CIty or State. They will get invaluable exposure and practice, and your club will garner awareness in your community for supporting great causes and helping young people achieve their goals. 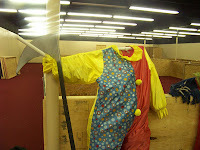 Scary body-like shape in an empty clown suit? Admit it - something about this picture is just creepy and it is only the beginning of the eerie fun that is planned just for the Wichita Falls, Texas community courtesy of the Sunrise Optimist Club. The Sunrise Optimist Club has been scaring kids, teens and families for 12 years with the Annual Haunted House and Carnival. 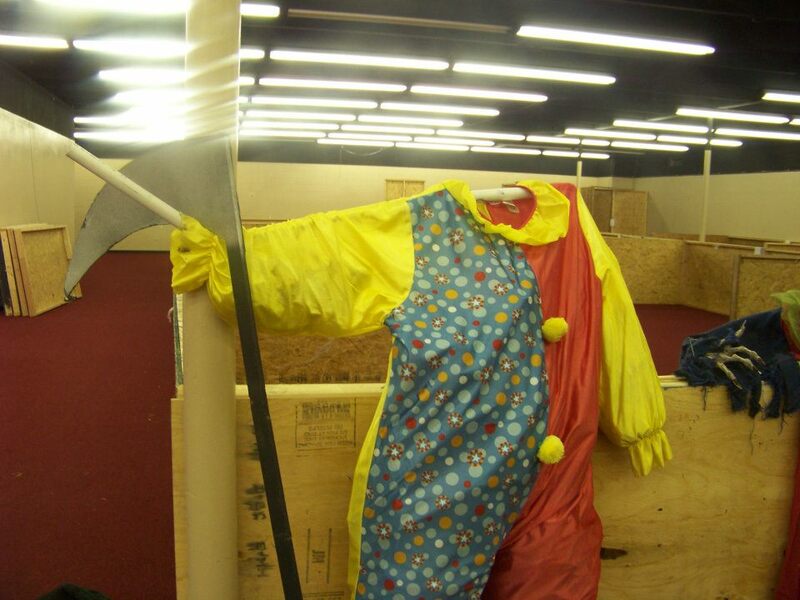 Located at 4704 Jacksboro Highway, there are fun attractions inside and outside of the haunted house including Butcherville, Death Row and the Graveyard. Don't care to scream? Don't worry, you can stay at the carnival, play creepy games and have your face painted and enjoy Halloween just as much as a ghoul. Find out more by liking the Sunrise Haunted House on Facebook or visiting their website. 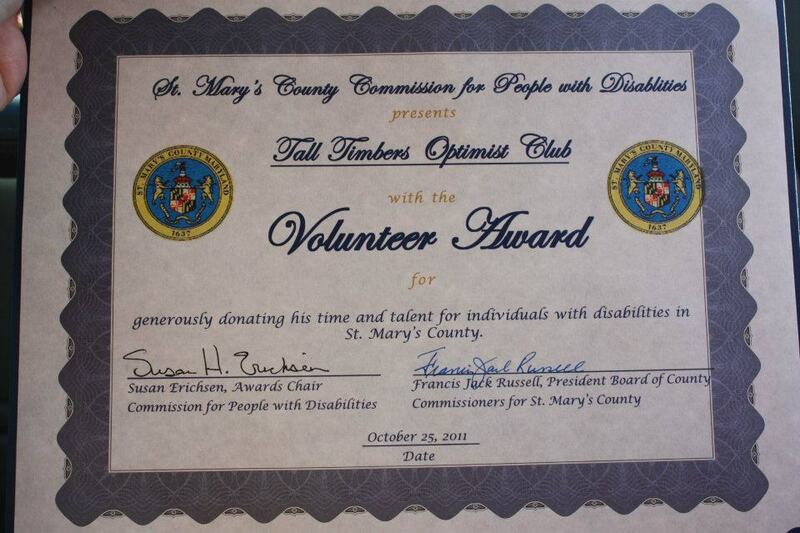 The Optimist Club of Tall Timbers, 2nd District, Tall Timbers, Maryland received a well-earned honor this week when they were recognized by the St. Mary's County Disability Commission for their work with special needs children. As part of the ceremony, Commission Chair Susan Erichsen explained that the Tall Timbers Optimist Club is "dedicated to bringing out the best in kids through its local community service and outreach programs." She described the Spring Dance, Shop With a Cop and the Fall Festival full of kid-friendly activities. She then hit on two programs that set the Tall Timbers Optimist Club apart from the rest: Camp Inspire and donations annually to a specific local child in need. 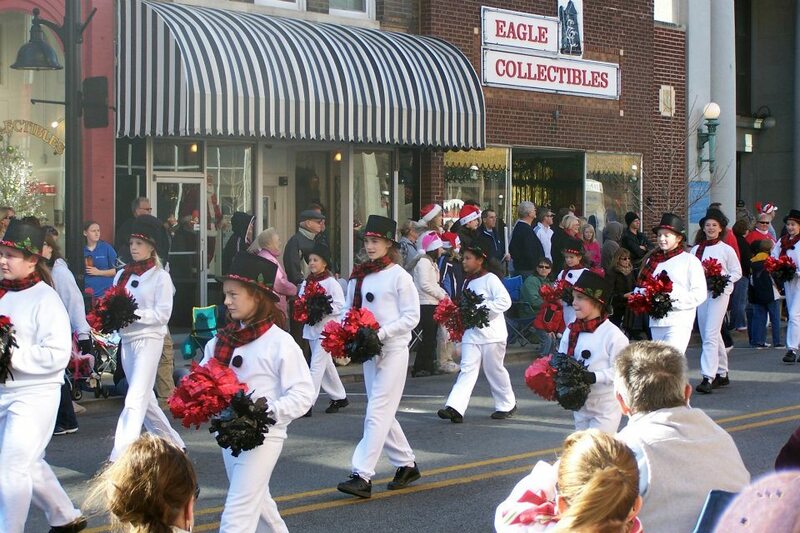 Each year, the Fall Festival proceeds are designated to these two programs. Camp Inspire is the first summer day camp in Southern Maryland designed especially for children with Autism Spectrum Disorders. It is coordinated by the St. Mary's Recreation & Parks District. 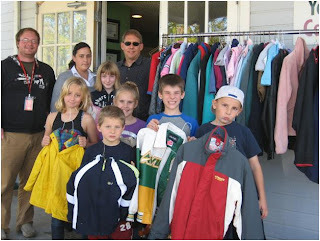 Specific children in need are also beneficiaries of the Optimist Club's fundraising efforts. Among others, some stories of past recipients include a 4-year old with cancer whose family received help with medical bills and a young boy with Cystic Fibrosis. The members of the Tall Timbers Optimist Club received the honor together as they were named "Volunteers of the Year." 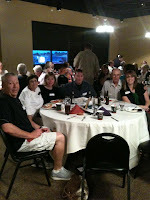 See more at the Optimist Club of Tall Timbers, 2nd District website. He has said yes to help more than 100 community organizations raise money and given to dozens more causes. An immigrant from Pakistan, Hamid Chaudry believes in giving back to the community that he and his family calls home and he does so through his business and his kind heart. Please watch the video from CBS News to learn more about what it means when Mr. Chaudry says, "God bless America." Local business owners are called upon often to donate to service clubs, sports teams, church fundraisers and schools in their community. For the most part, they want to help. Finding business owners with the ability to use their business as Mr. Chaudry does to split fundraising efforts is always a blessing. It brings business to his establishment, benefits the charity or cause, and above all, spreads the spirit of community to all. The next time your service club is looking for a donation, please consider that there might be a possibility to help your business community give back and get a little in return. Bring them customers and they'll always be there to support your cause. I promise. Elton John and Shawn Mullins share a duet of Border Song in this week's choice for Music Sunday at Experience Optimism. Two different styles that complement each other so well. The spiritual melody signifies faith even though the words speak of deception. Both speak of longing and belonging, but most of all the song reminds us, "Let us live in peace." For myself, I've found faith in optimism. Looking for the positive. Working for the best. Expecting that we can always do just a little more to help those around us. Imagining that what we do matters because it does. 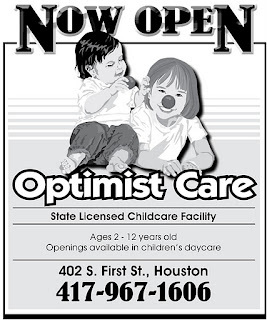 The Optimist Club of Houston, Missouri has started a licensed day daycare facility for children 2 to 12 years old. Just in its first month of operation, the facility is located in the Community Center and required a special use permit by the city council to get up and running. The hours of operation are 6:00 a.m. to 6:00 p.m. Monday through Friday, September to June with a special summer session being planned. While Optimist Clubs are often involved in meeting specific needs in their communities, this may be the first straightforward example of a commercial enterprise that I have seen established by a club. By starting a daycare facility, they are staying true to the mission of all Optimist Clubs to bring out the best in children. By licensing their facility, they are keeping in-line with the state regulations for keeping kids safe. By charging a fee, they are ensuring that the child care facility can remain open and viable as they work to develop even more projects with their volunteer benefactors, the Optimist Club of Houston. The Optimist Club of Eagle, Idaho held a membership drive this evening and as part of the presentation, members shared various moments of the year with a video presentation. Now entering the third year of operation, members spoke of why they had joined and what made the Optimist Club special to them: the kids that they are able to serve. Take a look. You'll want to get involved too. 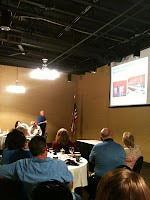 Thanks to Myrna Harris for sharing the slideshow. Find out more about the Eagle Optimist Club. Have you ever heard a story or song that sounds just a little different than the way you are used to hearing it? Does it bring up memories or perhaps a story of the way things were? Do you become nostalgic for a different day or time in your life? Stories are great; they bring meaning to what we see and hear in the present day, but they should never be taken as reality for a story is the teller's interpretation of an event or experience. When you hear the story it then becomes your interpretation of an event or experience. When you tell that story, it becomes the listener's interpretation, and on and on. It's not gossip. It's not inauthentic. It's life and art and music and everything moving forward through time and being experienced over and over again. So this song, originally recorded in the 60s, can be rearranged and performed on stage in the 90s, recorded and uploaded to YouTube in the 00s and then heard by me and shared with you today in 2011. We are all in different places than the first time we heard the song and free to like or dislike it in the moment and to have our interpretation change again the next time we encounter it. I think that's kind of cool. For Music Sunday at Experience Optimism, please listen to classical guitarist Michael Chapdelaine performing "California Dreaming" in his award-winning fingerstyle guitar interpretation. I challenge you, the next time you hear the song, in an elevator or as you are driving to work, think about how it makes you feel and who it makes you think about in the moment and draw strength from that new interpretation for that is what is real. Students at Vision Charter School prepare to "Let's Jump!" 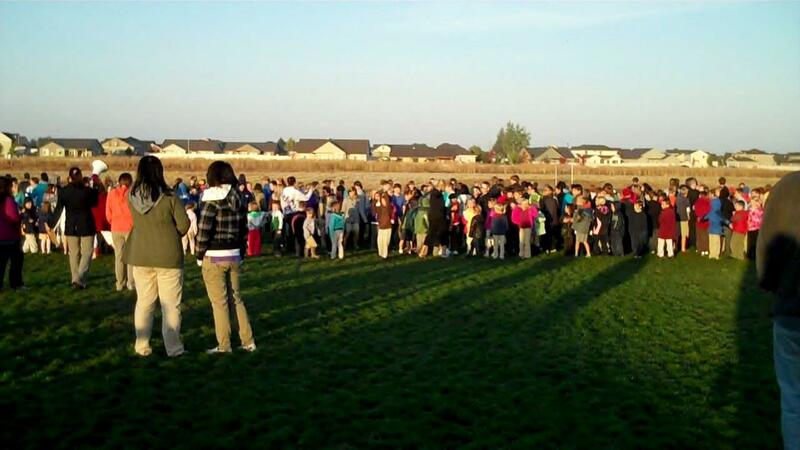 On Wednesday, October 12, 508 students started their day doing jumping jacks at Vision Charter School in Caldwell/Middleton, Idaho. 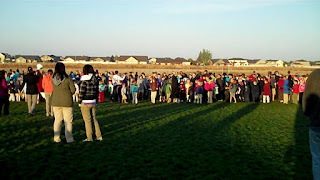 Prompted by the newly formed Junior Optimist Club, the school was part of the worldwide effort to break the Guinness World Record for the most people doing jumping jacks at the same time. They joined such high profile jumpers as Michelle Obama who led from the White House lawn. Word isn't in yet if they were successful in breaking the record, reports must be filed and verified, but one thing is for sure, it was a great experience for the Vision Charter School Junior Optimist Club. The club is just being formed, recruiting members and lining up community service projects to perform. The founding students saw this effort as a way to bring attention to physical fitness and have fun with people all around the world at the same time. They called their effort "Jump for JOOI," in tribute to the name for the youth membership of Optimist International: Junior Optimist Octagon International (JOOI). According to Erin Lair, school advisor to the club, the high school club plans to be active in the school and community. In addition to their ongoing recruiting efforts, their next project is a backpack program for students on free and reduced lunch. The Junior Optimists will fill backpacks with easy-to-prepare foods and students who are food insecure can discretely pick them up to help get through the weekend. One the strengths of the JOOI program is it fully self directed by the students. They see the need and develop ways to make a difference in their community. The Junior Optimist Club is sponsored by the Middleton Area Optimist Club. It is only the second JOOI Club in Idaho. T-shirt competition in Kirkland, WA. 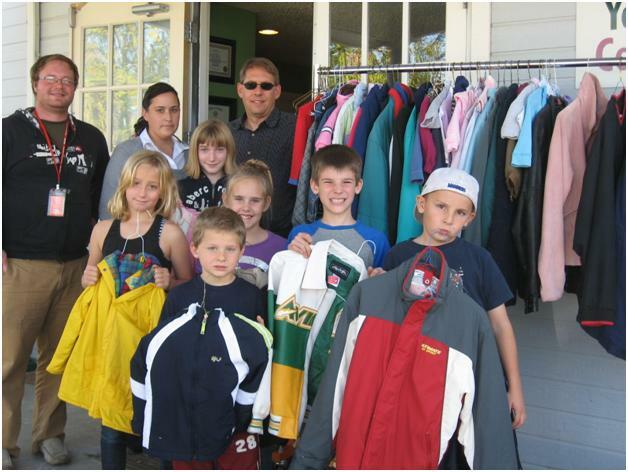 New Optimist Clubs often provide new projects in a community. Adults come together to meet a need that they have seen bonding in a special way for a cause they hold dear. Once that cause is identified, the organization comes together quickly and the work begins. 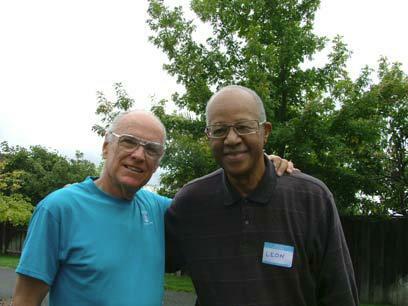 The Optimist Club of Lake Washington in Kirkland, Washington is on such a path. As their major cause, they have chosen wellness, especially health and wellness for children in coordination with the Apple Core project Bastyr University. That has put them in touch with a number of organizations that need caring adults including Boys and Girls Clubs, YMCA, homeless shelters, soup kitchens and the Kirkland Teen Union Building (KTUB) where they have just completed their second project. 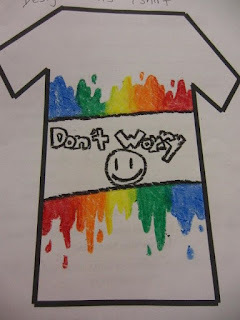 The project looks like a lot of fun: an optimistic t-shirt design competition. Each week, the club would meet with the teens to help them with their ideas and over the weekend, a winner was chosen. 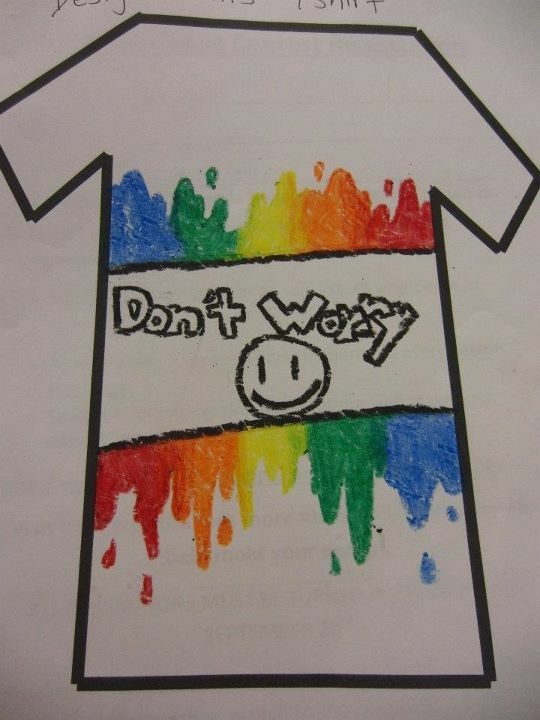 The first place entry says, "Don't worry." An optimistic thought indeed! See more entries on the Lake Washington Optimist Club Facebook page. Just put your heart into it and you can accomplish great things. Great, of course, is a matter of perception. So when this video popped up, in a week where activists are Occupying Wall Street, Nobel Peace Prize winners were announced and the world lost an icon of technology, I thought, what a great reminder; we should always take time to dance. Such a small thing - dancing. But did you know that dancing puts our bodies in touch with our minds and frees our souls. Dancing is a joyful expression of life. No matter the the challenges in our lives, we must find joy in the small things for sometimes it's the small things that require the greatest faith in our own abilities. Please enjoy this week's choice for Music Sunday at Experience Optimism: Alma Salsera Reynaldo y Claudia. Now go on, get out there and show yourself and the world what amazing things you can do when your heart and mind are one. While they share the mission of bringing out the best in children, all Optimist Clubs have their own unique cultures. Attending a club meeting in Boise or Meridian, ID will feel familiar, but not quite the same as a club meeting in St. Louis, MO or Granite City, IL. Those differences have much to do with the individuals who make up the club. Face it, we all have our own idiosyncrasies. Some are more formal and organized and others are more flexible and carefree. Clubs are no different so a group made up of predominately 50-something bankers and businessmen are expected to act differently than a group of predominately 30-something ladies. And as service clubs have a median age of 62, you can imagine that the retired set will act differently from those still in the workforce. One thing is for sure, no matter what Optimist Club meeting you might attend, they will have at least one inside joke that would take you months if not years to fully acclimate to. I think that is what is going on in this picture. I've seen it before and wondered what they were doing. The Optimist Club banners clearly indicate there is an Optimist Club meeting in action, but I wonder if it is a weekly meeting or special gathering? 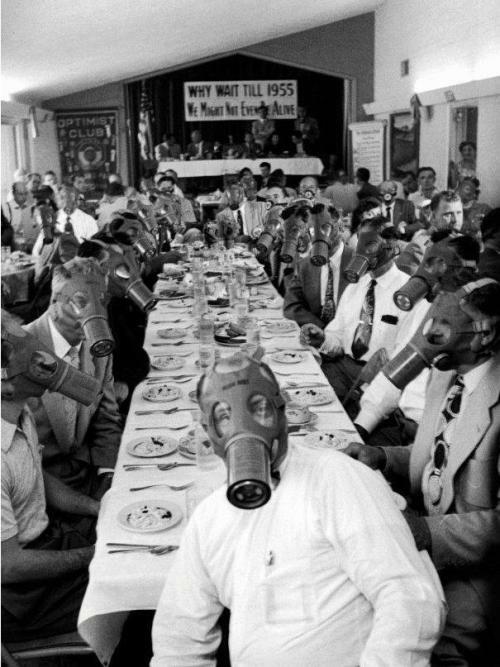 And are the gentlemen in the center table the only ones afforded gas masks and will they share? Optimist Clubs do great things for children and our communities and those special you-had-to-be-there moments are a bonus that comes from fellowship. Thanks to potoman.tumbler for bringing the curiosity to my attention again. 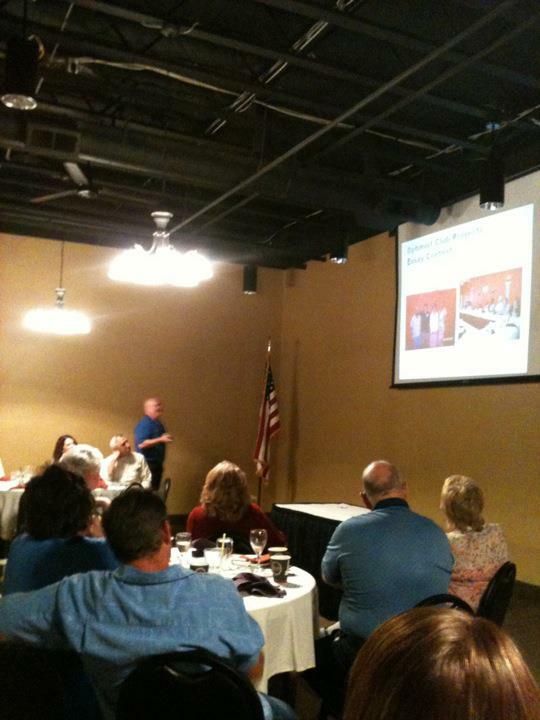 Create your own special moments by attending an Optimist Club meeting soon. Find an Optimist Club near you today. Born in 1911, this remarkable lady from Twin Falls, Idaho declares the credit card to be the worst invention of the last 100 years and the microwave oven to be the best. She plays the harmonica and much to her credit, she holds her own quite well with Jay Leno. This is how to experience optimism from everyday, ordinary living. Enjoy. In 2005, Steve Jobs gave the commencement address at Stanford University. In it, he tells three stories that defined his life. It is an inspirational message every day, but especially so today on hearing of the great innovators death. Rest in peace,Steve Jobs, 1955-2011. Please read more at http://www.wired.com/epicenter/2011/10/jobs/. The Optimist Club of Twin Falls, Idaho has teamed up with the Twin Falls Police Department to carry out the Every 15 Minutes program in the Twin Falls High Schools. The program is aimed to help students learn the dangers of driving under the influence. Every fifteen minutes, the police take a student from class and keep them apart from their friends and family for 24 hours in an effort for everyone to experience loss. The Twin Falls Optimist Club is helping raise money for the project by selling hand-picked apples straight from the orchard. They can be purchased from an Optimist Club member or at stands being set up around town the weekend of October 8-9. Please listen to the podcast from 106.7 The Canyon to learn more about the program and how the Optimist Club looks for programs that touch the most kids lives and then make sure they happen in their community. Do you have a passion for golf? Then you need to know about how the Optimist International Junior Golf Championship impacts children. With 30+ countries represented by 600 or more young people, the Optimist has been challenging junior golfers for 15 years. But don't count on me to tell you about it; find out from the golfers. Spoiler alert: The Optimist is fun! Every Optimist Club can sponsor a junior golf tournament. It's great practice for the golfers and all part of the fun to begin at the local level, send golfers to the district tournament and let them win their way to the PGA National Resort and Spa for the Optimist Junior Golf Championships. The tournament is held at the end of July every year. While most players earn their way to the tournament, at-large entries are also accepted. Find out more at Optimist International Junior Golf. It's been my number one song for a while, so it must be time to share it. "Moves Like Jagger" by Maroon 5 gets my blood pumping, moves me out of my chair and gets me to dance around the room. If headbanging is more your style, then bounce your head right along with the beat. You really can't resist it. Sometimes we need to get our blood pumping to raise our spirits; so turn up the sound and experience the optimism of Music Sunday with me. Please. I would also like to encourage you to keep moving this week and all through the month. According to a number of sources, there are good reasons to. Please click on the links to learn more. 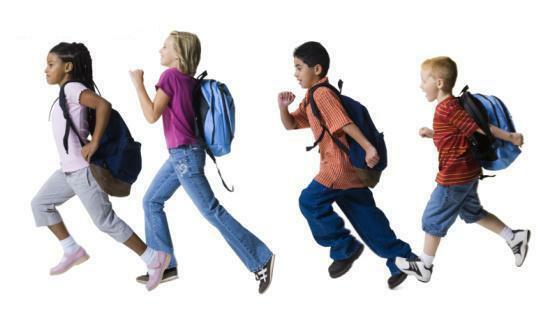 The Seattle Times says it is National Walking Month. First Lady Michelle Obama and National Geographic say, "Let's Jump!" @Good declares the 30-day challenge is to "Get Healthy."